Want to get married in central Italy? Rome, Tuscany, Naples, Sorrento, and Capri have many wonderful locations. The most Beautiful place in the world. This page will get you off to a quick start! Direct contact of wedding venues in these areas, all of which have an English version internet site and most of all English speaking people to help you out with everything! And what a about the music? Check out Michael Supnick's Swing and Jazz bands. Ask for a free quote after you've picked the the date and the location. Of course I speak English and I travel anyway in Italy and throughout Europe. Click on the photo below to to enlarge it! The 5-star Hassler hotel in central Rome specializes in organizing the most extraordinary luxury wedding receptions. Either on one of the panoramic terraces with the breathtaking view of Rome as the setting for your unforgettable occasion, or in the romantic Palm Court garden or one of our private salons, the Hassler offers the most special and luxurious venue in Rome. The additional services our events team is happy to provide includes: floral decorations, customized menus, place cards and table plans, live entertainment (from a classical string quartet to a jazz band), beautiful wedding cakes, a photographer or videographer and exceptional dining services. We also can organize the make-up and hair-styling for the bride and guests, as well as other beauty treatments either in suite or at the Amorvero SPA on the third floor. A magic location for your most special day! Unique settings for your memorable moments. Cosy and welcoming atmospheres like the hug of your special one. The unicity of a moment to remember. Come visit us at the Saloni di Palazzo Brancaccio, you will feel at home. Imagine your reception or your ceremony, you can choose and combine decorations, furnishing, table clothing and of course the food. Choose from any from the many menu offers, or ask for a personalized menu! We are here for you, to help you make your dream day come true. If you are searching for the most suitable chapel for your wedding, there are a number of beautiful churches in the vicinity of Palazzo Brancaccio. At the bottom of this page you'll find a map on which we have indicated the location of these churches, among the most beautiful in Rome and most suitable for weddings! Built in 1837 by the "Society of Monte Mario" for the Counts Miani, Villa Miani is an elegant neoclassical building on the hill of Monte Mario. This beautiful home umbertina is nestled in a well-kept garden it offers a breathtaking view of Rome, almost touching the dome of St. Peter. To be achieved through the private road for about 1 mile through a park, is a point of reference for the organization of receptions and conventions to which they are dedicated about 2000 square meters of halls and wide open spaces, terraces or garden facing the lake. A private parking area completes the accommodation capacity, making it suitable for large events. a Michelin Star restaurant, wines by Baracchi winery and a charming Tuscan venue under the Tuscan Sun, what else but say YES I DO. Being at Il Falconiere is like stepping into a different world where time is slow and the living is gracious, yet relaxing and very charming’. The little family chapel, the swimming pool among olive trees or the vineyards would be the perfect setting for your perfect day. The Hotel Bernini Palace in Florence is situated in a 15th century building in the heart of the city, behind Piazza della Signoria and the Uffizi Gallery. It is also just six minutes from Via Tornabuoni, the most famous shopping street, and approximately one hour away by car, it is possible to reach outlets for major Italian labels such as Prada and Gucci. The Chiostrina, the new hotel’s Restaurant, offers a menu of exquisite, innovative regional dishes. In addition to this, in the surrounding area are situated the most exclusive restaurants in the city, such as the Enoteca Pinchiorri, as well as a selection of typical Florentine trattorie. Special occasions can be organized all year round. In the summer the courtyard with loggia, hanging garden and other out-door spaces become an ideal setting for cocktails and buffets. The large rooms inside can cater up to 200 people. During the winter they can be fully heated and are graced with a large fireplace. At night, when Mugnana is lit up, the atmosphere is magical. In the grounds there is also a private chapel which can be used. The castle is easily reached by car and there is plenty of parking. Clients are free to organize special occasions with any catering company, decorating and furnishing as desired, Mugnana has no exclusivity agreements with any organization. 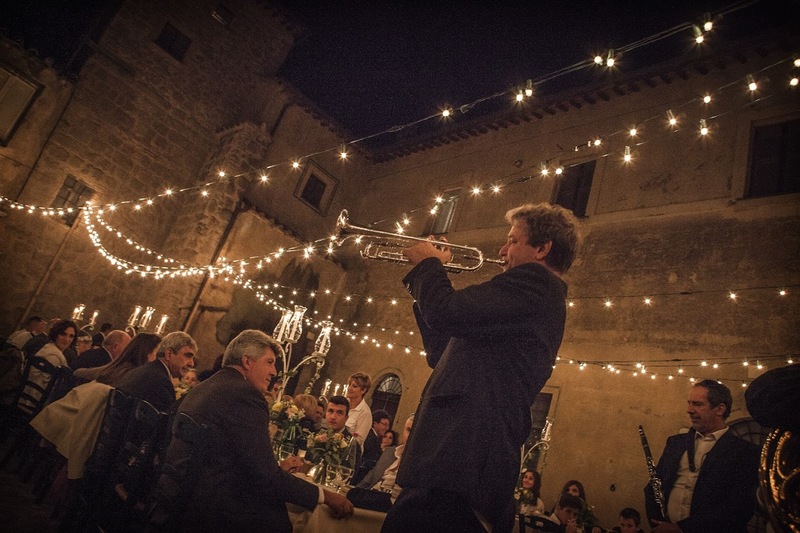 Le Volte di Vicobello are the perfect place for an exclusive party, special event or one-of-a-kind wedding celebration. The organisation of your event can be fully arranged by our professional chefs, banqueters, flower designer, we offer our expertise, advice, and professional support throughout your planning process making your organisation effortless from beginning to end. Or you can opt for a more personal involvement in the setup of your unique celebration, meeting or party. Please book at least 8-10 months in advance. This luxury palace will be the most suitable location to host your wedding, receiving your guests at best. Palazzo San Teodoro can host up to 230 people and the enchanting rooms will let you choose the right place for each instant of your wedding reception. The warmth and the atmosphere created by each room make your day a magic one. The service, curated in all the details, transforms an important moment in an unforgettable day. Marechiaro Villa & Relais is an historic residence, constructed at the end of the nineteenth century. It’s elegance is demonstrated in the furniture and in the antique rooms decorated by the antique majolica tiles produced by Stingo manufacture, which are in harmony with the modern elements. The residence was completely renovated in 2005 to guarantee the maximum comfort for the clients. The accommodation includes the use of the swimming pool, the solarium roof and the finnish sauna. Let yourself be pampered by the welcoming and hospitality of Marechiaro Villa & Relais for a dream vacation. Hotel Punta Tragara, the ultimate in five-star luxury on Capri, towers over the Faraglioni rock formation, Marina Piccola bay and the Scoglio delle Sirene cliffs from above. Located at the end of delightful Via Tragara, the Hotel can only be reached via a 15-minute stroll along one of Capri’s most enchanting routes. Set out from the town’s historic Piazzetta, head along boutique-filled Via Caramelle then follow Via Tragara. You’ll find yourself instantly in another world, the real Capri, perched above the sea amid the silence of nature, but just a stone’s throw away from the beau monde. Capri - It's impossible to miss the grand entrance of the Quisisana, just steps from Capri town's central Piazzetta. This iconic five star hotel has been the favorite of politicians and poets, royalty and rockstars since it opened in 1845. Outside on the legendary terrace, famous and not-so-famous guests relax and watch the bustling crowds of visitors to the island of Capri pass by. Inside, a luxurious oasis of peace and tranquility awaits, where shimmering chandeliers, polished marble floors, gilt-framed mirrors, and the warmest of welcomes immediately transports guests to another world. As a distinctive landmark, The Excelsior Vittoria has been known and adored by generations of celebrities, leaders and socialites. With a genuine mediterranean fin de siècle ambience and impeccable service, The Excelsior Vittoria is ideal for meetings, events, special occasions and weddings. A five star hotel peaking on the waves, with terraces dominating the Gulf of Naples and a postcard Vesuvius on the background: The Bellevue Syrene, one of Sorrento’s well-known hotels, is located in a place of timeless beauty. Ancient fish shops and Nymphea prove the presence of the Romans – From Augustus to Tiberius and Virgil – and legend goes that this place, set between rocks and sea, was so beautiful that the Mermaids chose it as their home. Born as a patrician residence, then became a villa, the five star Bellevue Hotel of Sorrento is open all year and offers a modern hospitality which has its roots in a tradition that seduced intellectuals, artists and heads of State. Knowing that your wedding will be one of the most important days of your lives, we strive to exceed expectations for service, quality of food and presentation. Silver cutlery sets, elegant table linens, white covered chairs, iron chandeliers with white candles, buffet decorations, comfortable sofa corners and many other details to make your wedding reception in Sorrento a day to remember! The original and different setting creations for each event is only one of the several important plus of our Villa: always a different reception from all the others and you will be, together with us, the main designer. If you are thinking about the most important step of your life, your most beautiful day and a dream location ... the answer is ... getting married in Sorrento at Grand Hotel Riviera! A lovely location with views overlooking the sea directly on the Gulf of Naples. It will be the perfect setting for the celebration of your ceremony. The Grand Hotel Riviera having two beautiful rooms with terraces on the sea will satisfy all your needs. The reception will begin with an aperitif served in our lounge and on its terrace, where guests will be welcomed by our attentive and caring staff. Our chef will delight you with a selection of hot and cold canapès, tapas and other delicacies accompanied by cocktails, prosecco or champagne. After the cocktail guests will be invited to sit in the Gala hall for the wedding lunch or dinner. White table linen, floral decorations, silver cutlery, crystal glasses, and impeccable service will ensure a classy reception. Attention to the smallest detail has distinguished the Grand Hotel Riviera for over 40 years.